[easingsliderpro id=”2″] Take The Plunge For This Once in a Lifetime Experience… Get up close and personal with one of the ocean’s most majestic and foreboding creatures – The Great White Shark, face to face! 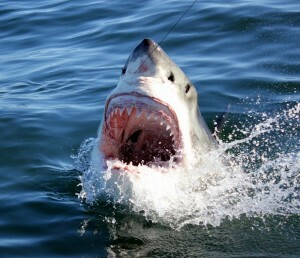 Great white shark diving in South Africa has in recent years become one of the most popular extreme sports. The prospect of being in a steel cage within inches of those powerful jaws and razor sharp teeth is enough to send icy chills down anyone’s spine! The adrenaline rush, however, is mostly based on mankind’s irrational fear of the great white shark. Let’s face it, the name “Great White” generally conjures up stereotypical images of a blood-thirsty killing machine. Movies such as Jaws and the likes have subconsciously brainwashed many into believing these apex predators of the ocean are mindless man eating monsters that will hunt, mangle and devour anything. Subjective and overly sensational media reports on shark attacks have also, over the years, created mass hysteria and contributed to the unfair stigma attached to these elegant hunters. Thankfully, the truth is far different from the stereotype and it is our mission to display this to every client every day on our trips. Go shark cage diving in South Africa, and find out the truth about these magnificent animals. Before the trip, guests will meet in Kleinbaai. You will receive breakfast or lunch and register your wetsuit size. Guests then receive a pre-trip safety briefing about what to expect during the trip and a biological background on great white sharks. We then take a 200m stroll down to the harbour to board the purpose built vessel with top viewing deck. Travel time to Dyer Island is approximately 20 minutes, with the shallows being a short 10 minute ride (where we anchor depends on where the sharks are). You might also see whales, dolphins, seals, African penguin as well as incredible seabird based upon season. On average, we anchor for 2 hours, but this depends on shark activity, conditions, as well as number of divers. Weather permitting, we may take a quick trip through the infamous Shark Alley. Lastly, a debrief and a celebratory beverage to toast the occasion! (Note: Trips are cancelled during bad weather which does happen a few times a year). Warm clothing as it is colder at sea than on land, Sunscreen and hat. It will be easiest to put on your wet suit if you already wear your swim costume on arrival. Please leave your valuables behind as there are no lockable locker facilities on board. Please use anti-seasick medication well in advance if you are prone to motion sickness. From US$160.-* per person includes breakfast, required diving equipment, towels, waterproof/windproof jackets, lunch and drinks on board. Comprehensive safety and conservation briefing by marine biologist.Gaansbaai is located only 2 hours from Cape Town along a scenic route. Return transfers are available from US$50. How safe is it to dive with Great Whites? Very. 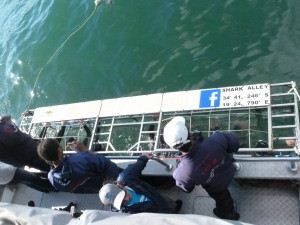 Shark cage diving has in recent years become one of the most popular extreme sports. The prospect of being in a cage within inches of those powerful jaws and razor sharp teeth is enough to send icy chills down anyone’s spine! The adrenaline rush, however, is mostly based on mankind’s irrational fear of the Great White Shark. Movies such as Jaws and the likes have subconsciously brainwashed people into believing these apex predators of the ocean are mindless man eating monsters that will hunt, mangle and devour anything. Thankfully, the truth is far different from the stereotype and people learn this every day on our trips. The vessel is custom built for superior safety and stability and our dive master skipper and crew have more than 30 years’ combined experience of the sea conditions in this area. We do operate in the “Cape of Storms”, so all our trips are strictly weather permitting. Every trip is preceded by a introductory safety briefing. You are not allowed to jump overboard or to feed, stroke or scare the sharks to “bond” with them – no matter how friendly or companionable they may look! Before we launch, all passengers are fitted with comfortable inflatable life-jackets. Safety is of the utmost importance and we have made the wearing of these jackets compulsory while the boat is moving. This has been designed for your own safety and for the comfort of all of our guests. Should you jump overboard to test the water, you will be floating and thus we can quickly haul you back to safety. Don’t give us any ideas about trying out a new decoy! We also have a lid covering the top of the cage, which prevents any accidental intrusion by a shark. Even if you open the lid, it is highly unlikely that a shark would want to snuggle up with seven goggle-eyed aliens! The cage is made out of a 1 inch galvanised mild steel frame and covered with .4” galvanised mild steel security mesh. It will have to be a miniature shark to get through that mesh! The vessel carries a medical kit and oxygen, and a life raft for 60 people. This is above-standard mandatory emergency precautions. We adhere to all safety regulations set forward by SAMSA, the South African Maritime Safety Authority, and DEAT, the Department of Environmental Affairs and Tourism. Before the trip, all clients receive a safety briefing explaining the rules and safety precautions aboard Slashfin. The rules are simple: slow and steady into the cage (no jumping!) and don’t try to touch the sharks (yes, you will be tempted). The Great white is one of the top predators in the world. They have one of the most developed sensory and visual systems of all fish species and are highly sensitive to vibrations and electrical impulses. These qualities, combined with their counter-shaded streamlined, torpedo-shaped bodies and powerful tails that enable them to slice through the water at speeds of up to 30 – 38 miles per hour in short bursts, make them a most formidable hunter and an expert on surprise-attacks. The presence of sharks is a key indicator of the health of a system. South Africa boasts one of the largest concentrations of Great Whites and other shark species thanks to our prolific and diverse marine life and contrasting oceans. Great whites may have some of the fastest healing rates known in the animal kingdom, with incredibly strong tolerance to injury and illness. Cases have been recorded of sharks making a full recovery after being severely injured by boats or encounters with other marine animals. They are partially warm-blooded to adapt to contrasting and extreme water temperatures. This enables these migrating animals to be equally at home in the cold waters of the Atlantic Ocean, the warmer Indian Ocean and tropical waters. Recently more and more Great Whites are found along North American shores. Great Whites do not have that cold, staring fish-like onyx black buttons for eyes that most people think. Contrary to popular belief, their eyes rotate in their sockets and they are actually a stunning midnight blue! In good light one can clearly distinguish the circular pupil and dark iris ringed with a spectral hint of bright blue. They have no eyelids and roll the eyeballs back in their sockets to protect the vital front part of the eye from being scratched. Their highly developed visual system – in certain aspects more advanced than our own! – enables them to see perfectly in day or night light and their retinas are particularly sensitive to contrast and motion. They are migratory animals and can travel vast distances in short periods of time. One has been tracked swimming from Dyer Island, South Africa to Australia’s north-west coast and back – a journey of 12 000 miles – in 9 months! Despite this, experts are not sure why, when and where they travel. Great Whites only reach maturity between the ages of 15 – 20 years. Nobody has ever witnessed a Great White mating or giving birth in the wild, but we do know that they are born live and that the new born pup is self-sufficient at birth. They are ovoviparous, which means the eggs are fertilised in the female’s uterus where they also develop and hatch while still in the womb. After a gestation period thought to be 12 – 18 months, the females may give live birth to 2-8 fully formed pups measuring between 4 feet and 5.2 feet. Great whites have up to 300 serrated, triangular teeth arranged in several rows. When they lose or damage a tooth, it is replaced by a new one throughout their life. It is believed that a Great White may use and loose up to 30 000 teeth in its lifetime. They are selective carnivorous feeders. They hunt and feed on a wide variety of fish, seals, sea lions and even dolphins. Great White Sharks use body language to communicate. As far as we know, white sharks do not produce noises, other than slapping their jaws. Body language has been a well documented form of communication and has identified body arching, jaw gaping, and other postures as specific social tactics.